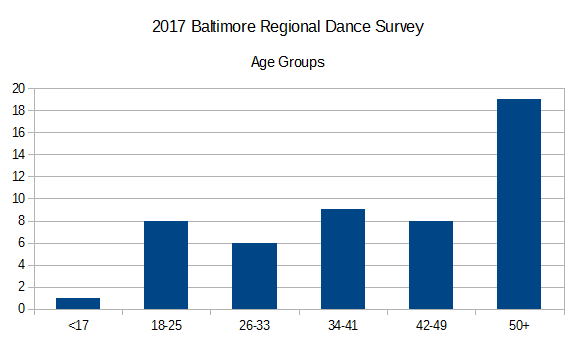 Continuing to explore the demographic bits of the Baltimore Regional Dance Survey (we’ll get to dancing eventually, I promise…), we come to gender and age. 51 of 80 valid respondents made it far enough to answer these questions, and everyone that made it this far answered both. I’m sure there is a large sampling bias represented here. Part of the survey methodology was to engage the four-year degree dance programs in the region (I’m not clear if the survey reached UMCP…). This will naturally bias toward older age (you are less likely to be teaching at university if you’re under 17…) and toward dance teachers (because, that’s literally the job description). Another part of the survey methodology was to contact dance studios, and contacting a studio at a generic studio-email-address is likely to find an owner/instructor, and owner/instructors are likely to be older, because, well… it takes time to build a studio. I did look for any obvious single-studio clusters where a large number of respondents appeared close to one another with similar responses (as I would expect if an instructor made an announcement to their students) and didn’t see anything like that. Combined with the number of respondents, it seems unlikely that many (if any) studio owner/instructors shared the survey with their students or colleagues. Obviously, some work is required here to expand the pool of respondents. I made several personal appeals to share links to the survey with other dancers, and specifically asked that ALL dancers, regardless of their level of experience participate and share the survey with colleagues. 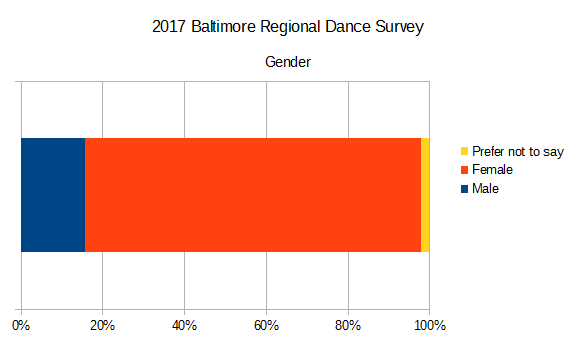 On some level, I do realize that there is a trust issue (It’s one of the reasons I’m doing this survey breakdown “live and in public” for the benefit of the greater Baltimore dance community). Perhaps, with this survey commentary available for future respondents to review, dancers will be more likely to participate in future surveys. Next Next post: How Do Baltimore Dancers Spend Their Time?